The new external frame with pegs and curved edges, together with the perfectly effective locks and the original round design of the pegboard make the Fantacolor Design line one of the best offers in the market for inventiveness, safety and purposiveness. The board can also be positioned vertically, standing on its base just like a picture frame, so that your children’s masterpieces can be displayed in full view! The built in handles make it the perfect travel-size toy: the pegboard locks firmly on top of the frame and all components can be safely stored and easily carried around. 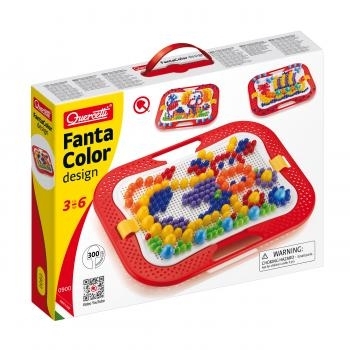 The kit also includes an album with fun designs for your child to copy.